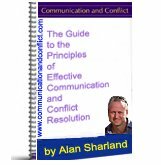 Communication and Conflict Newsletter - What is Conflict Coaching? Check out the Archives - Click Here to see all the back-issues of the Newsletter. Have you not subscribed to the Communication and Conflict Newsletter yet? This Newsletter gives an answer to the question 'What is Conflict Coaching?'. This exciting new practise has emerged during the last few years as a very different form of process aimed towards resolving conflict. At CAOS Conflict Management we use a model of Conflict Coaching that developed out of a particular approach to mediation that seeks to support resolution at all points of interaction with the disputants, including when they telephone to refer themselves, when they are met with individually prior to any joint mediation meeting, and of course during a joint meeting if it goes ahead. 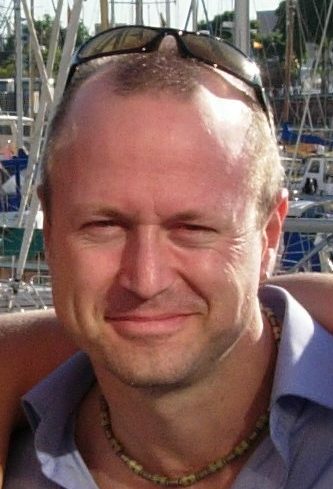 Prior to launching CAOS in April 2011, I was Director of a community mediation service providing mediation to neighbours in dispute in the London Borough of Hillingdon, West London. A feature of neighbour mediation is that on many occasions a joint meeting between neighbours does not occur because one or both parties do not wish to meet. While in most other areas of mediation a joint meeting is likely in approximately 80% or more of cases, in neighbour mediation this figure can be as low as 20%-40%. For many community mediators this can be a source of frustration and discouragement but because I'd already worked in community mediation services prior to Hillingdon I developed a model of mediation that accommodates this low figure, benefits and 'believes in' the disputants and has many resource saving advantages. The model is also applicable to any field of mediation and has the same advantages including the possibility of less hours spent in mediation for resolution to occur. Train to be a Conflict Coach - Spring 2012 - Introductory 'Taster' Day 7th March - Ealing, West London. We adopted an approach that meant that, at all points of contact with a client, we sought to help them explore possible ways of resolving their difficulty. So for example, an intake call was not just to gather information to create a case file, it was also an opportunity for the Case Manager, a trained mediator, to explore with the client ways in which they might resolve their situation even if their neighbour did not wish to participate. On many occasions, clients came back to us before we had even allocated mediators to say the discussion with the Case Manager had helped them to approach their difficult situation in a different way which had led to resolution of the dispute. As well as this, our 'visits' to see clients would adopt the same approach - we would explain what is involved in a joint meeting so that clients could consider it as an option but we would also explore with clients what they may be able to do to resolve their situation even if their neighbour did not wish to take part. Again, on many occasions this approach meant that cases were resolved by clients without the need to go through the whole process of mediation and indeed it meant there wasn't a sense that resolution was dependent on a joint meeting occurring which seems to be a perspective adopted by many models of mediation. As an added benefit for a publicly funded charity it was a more effective use of resources in that 'joint meetings' were not the only route to resolution, a simple discussion with the Case Manager was able to assist where other approaches may not have begun that process until both parties met in a joint meeting - and given that often they didn't want this, such situations may not have had a chance to resolve via other approaches. So how does this lead us to an answer to the question 'What is Conflict Coaching?'. Well the point is that in our mediation model (which we also now use at CAOS Conflict Management) these interactions supported and enabled the possibility of resolution through just a 1-to-1 interaction with one or both parties separately that were involved in a dispute. Resolution came from the participants via their own actions without the need for a joint meeting. They unilaterally chose to take actions that resolved the situation following an opportunity to reflect on their situation and be encouraged by creativity generating questions from the mediators to formulate different actions or different perspectives about their situation that led to it being resolved. No joint meeting required. As a result of this we piloted a 2 year project starting in 2008 to explore the use of Conflict Coaching and to develop a model based on our present approach to mediation. Conflict Coaching takes this approach even further as it offers individuals who are experiencing stress, difficult emotions, health difficulties etc. as a result of unresolved conflict but who are open to the possibility that they may be able to create other ways of responding that may be more self-supporting and constructive, the chance to do just that. Where an individual is open to considering that their own responses may not be the best they can be in a situation, Conflict Coaching can provide a powerful support on their journey to discover better ways forward, for themselves and for the situation they are finding difficult. Where the 'cause' of the difficulty is considered to be solely due to someone else it is unlikely that person would consider Conflict Coaching. Examples of this can occur in situations where someone feels bullied. Often there is an approach that is based on the belief that the only way forward is for the 'bully' to change their behaviour rather than for the individual to find more self-supporting responses to the behaviour seen as 'bullying', and thus the situation remains entrenched as it is extremely difficult to identify and confirm that 'bullying' takes place, as the definition of bullying is so often ambiguous. Some may find that a difficult perspective to accept but my main reason for giving it is that the issue of 'bullying' is one that does not seem to have moved on in any real sense despite a lot of attention and resources being devoted to it in schools and in the workplace for some time. For me an entrenched, unresolved conflict is characterised by the phrase 'If you keep doing what you've always done, you'll keep getting what you've always got', and I would see that as being applicable to most of the approaches to bullying adopted at present. Conflict Coaching can be provided to either someone described by others as a 'bully' and for someone who feels they have been 'bullied'. it can support both in finding more effective ways of responding - carried out without blame, without labelling and therefore without as much resistance to exploring their responses to the situation, rather than justifying or denying. So What Happens in Conflict Coaching? Well, here I must identify that, as with mediation, counselling, therapy and other 'human support services' there are different models of approach and in this article I can of course only explain the CAOS Conflict Management approach to Conflict Coaching which we have used and trained others to use. I will give a brief explanation of the practicalities of Conflict Coaching but below that there are a list of 'features' of the process that may distinguish it from other processes. A Conflict Coach will usually be a trained mediator although this is not always the case. The approach is not one of 'assessment, diagnosis and treatment' by an 'expert', it is one of 'listen - summarise - question' to support 'self-assessment, self-diagnosis, self-treatment' by the real expert, the client. Purchase the CAOS Conflict Coaching Clients Handbook for just £4! "Conflict coaching helped me very well. It helped me to see differences in the dispute which has been here for years. Conflict coaching has given me peace of mind. I feel much better." " Yes.... it was wonderful! It gave me a way of looking at a different way of thinking....a way of viewing something differently. It filled a gap. The situation still continues but the coaching has helped me to cope." The aim is to help the individual reflect on and identify their own difficulties, challenges, difficult feelings, wishes and aims in order for them to understand themselves more thoroughly and how they are responding within their difficult situation, unresolved conflict, communication breakdown etc. The Coach adopts an 'adult-adult' approach to the client with the aim of supporting their empowerment and by ensuring ownership of the difficulty remains with the client and does not become seen as the Coach's responsibility to 'solve'. Conflict Coaching challenges the individual to acknowledge their own part in a difficulty and to take responsibility for making the necessary changes in their own behaviours or perspectives in order to find a way forward towards resolution. There are never more than 3 sessions of Conflict Coaching. The onus is on the client to make full use of the sessions as a 'tool' to help them with their difficulty and not as a continuous opportunity to 'offload' without some personal commitment to making changes. Whether the client does or not is not something the Coach can control but the safeguard against offering more and more sessions 'until' they do is put in place by the upper limit of 3 sessions. The Conflict Coach provides a framework of reference points, through which the client can explore their difficulty, that is based on a set of 9 Principles of Effective Communication and 3 ways of responding to conflict, 2 of which never lead to resolution, one of which is the way in which resolution always develops from any situation, what I have called 'The 3 Cheers for Conflict - Learning, Connection and Insight'. Each situation will obviously be different and the client is helped to explore what they feel are the relevant Principles of Effective Communication and which approaches to conflict they are adopting. The Coach will help them consider the impact of their present actions and whether there are ways which they can create through which they can respond differently in future, that will help improve their situation and their experience of it. Join the Communication and Conflict Affiliate Program and earn 35% on all sales! You will be sent an email for each sale originating from your website. Each month's earnings will be paid via PayPal within 15 days of month end. •	A focus on ‘ownership’ by the client including non-diagnosis of an individual with regard to their difficulty. That is to say we don’t analyse and then label clients as being of a particular ‘type’- we help them explore their behaviour not seek to 'label' the person. One of the most common statements made by clients in our pilot project when they called to refer themselves was an experience of counselling or therapy where they had been diagnosed with a label such as 'procrastinator' or 'withdrawn' but felt little more had happened beyond the labelling that helped them with their difficulty. Conflict Coaching is not seeking to replace counselling or therapy and so diagnoses of these types may have a place in these processes, but it was of importance to us to avoid the use of labels or to diagnose and simply to help clients focus on the experiences or behaviours they were finding difficult - their own and others' - and then to look at creating other responses/behaviours/perspectives that they may find more constructive. •	There is a maximum of 3 conflict coaching sessions. This is to ensure the process does not become a dependency or an opportunity to simply ‘offload’ about the difficulty. It is also for the Conflict Coach to be clear about their own commitment to ‘letting go’ of the difficulty. An inclination to want to give more sessions to one client can indicate an attempt to try to own the client’s difficulty and / or ‘rescue’ them. •	No-one ‘needs’ conflict coaching. However people may want to use it to support themselves with a difficulty. •	It is crucial that conflict coaching arises from self-referral by the client and no-one else. Even if the service is paid for by an organisation for its employees/members, it is important that the client takes the personal step of referring themselves. •	The aim of Conflict Coaching is ultimately to support the client in becoming their own conflict coach and to support the development of their own self-awareness with regard to how they communicate and how they respond to a conflict. The client does not come to the coach for ‘assessment, diagnosis and treatment’. •	‘Goals’ may or may not be part of the discussion within a conflict coaching session, unlike many forms of coaching, as it may not be the client’s preferred outcome from the sessions. Clients can simply want a 'space' to explore their thoughts and feelings in relation to their difficult situation or experience in order to come to a different relationship with it. This may not include tasks, benchmarks, goals, targets etc., it may simply mean developing a greater level of self-awareness with regard to how they respond to the situation. •	Group conflict coaching can take place in which participants in a group support each other in developing self-awareness regarding their approach to communication and responses to conflicts they have experienced. The facilitator provides a framework via the Principles and Underlying Philosophies to support the group in reflecting on and learning from their conflict(s). •	The Principles and Underlying Philosophies of Conflict Coaching apply as much to the arrangement of sessions as to the sessions themselves as the interactions involved in this can in themselves be part of the content of a conflict coaching session. As an example, how a conflict coach and the client manage a situation involving a late arrival by either, or failure to turn up, or the payment arrangements for a session. •	Conflict Coaching is simply a tool for clients to use to enable them to respond more effectively to a difficult situation they are experiencing, much like an electric drill can enable a more effective drilling of holes than a hand-held one. Once the client is comfortable with the tool they are able to pick it up whenever needed, use it and put it away when not needed - in the sense that, if initial Conflict Coaching seeks to help people to become their own conflict coach, they develop their own tool for future use through the sessions attended. And as with using an electric drill to more effectively drill holes than with a hand-held drill, the use of the tool does not imply there is something ‘wrong’ with the user of the tool. The client is simply looking for means of more effectively dealing with the difficulty they face. Learning - about new, practical ways of doing things in a situation if present ways are not working. Connection - learning to understand another person's point of view without having to agree with it - rather than to dismiss it. Insight - gaining awareness of ourselves and our 'reactions' to situations and our other thoughts and feelings when we experience our unresolved conflict or relationship difficulty. "It only takes one person to end a war - and you're the one. What a perfect set up!" While we wait for others to change, we remain frustrated, outraged, stressed, depressed - and we render ourselves powerless. Conflict Coaching offers people the opportunity to question and possibly change their responses to, or their views and beliefs about a situation. This is not to remain 'passive' in the face of unacceptable behaviour, it is to find a way of supporting ourselves first in order that we can respond more effectively to the behaviour we find unacceptable or to find a different way of seeing the situation if we feel unable to do anything to change it. Through creating different responses or perspectives we give ourselves a choice, and having choices, created by ourselves, we have empowerment. From Conflict to Calm - How to deal with conflict at work is an excellent resource for helping to come to terms with how we deal with conflict, based on the personal story of the author, Cristina Diaz, in which she describes the challenges she faced in learning to respond more effectively to a conflict at work. So many features of how she approached her situation fit well with the Principles of Effective Communication discussed on this site and are in keeping with the Underlying Philosophies of Mediation as well as the 3 main ways in which we respond to conflict. Click here to view more details of this excellent book. Cristina provides a Workbook alongside her story that support the reader in reflecting on their own situation in order to consider how they feel and how they are responding to their difficulty and whether there may be better ways of dealing with things. "I would like to help you realize that we’re not slaves of situations at work (or in life, for the matter) just because someone with their peculiarities is in charge or in direct competition. We have the power to mold ourselves through our thoughts and thus mold the reality around us." - from page 5 of From Conflict to Calm - how to deal internally with conflict at work. As Cristina alludes to in the above statement, the ideas and approaches and the Workbook are not just of relevance to difficulties in the workplace - they are also of benefit for difficulties in other areas of life - within the family, in the community, with our partner, with our children, within ourselves. "You now have a choice. You can try to change the person and the circumstances that gave way to your thoughts and emotions, or you can deal with your thoughts and emotions instead. It is far easier and effective to deal with your own thoughts and emotions. This is, in fact, the only one thing you can actually do to stop feeling bad." 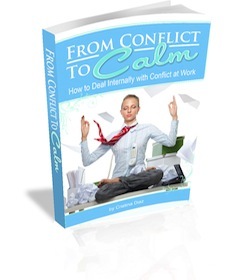 - from page 7 of From Conflict to Calm - how to deal internally with conflict at work. ....and the one that left me laughing and smiling - Stepping into the positive with the 3-word formula 'I like it'. Click here to find out more about this excellent and useful e-book. For a limited period only (up to end of February 2012), you can have a reduction in the price of From Conflict to Calm by using the code CandC when you purchase it. 'From Conflict To Calm: The Workbook', a practical 27-page PDF which complements the handbook to help you understand your own situation of conflict at work. '27 Inspirational Quotes on Conflict', a neat ebook by Steve M Nash with quotes that will bring you inspiration. 4. Don’t lament with others about how bad the situation is. It feels good to commiserate with others and share the feelings about “how unfair this situation is”, because it feels that we’re understood. The problem with this behaviour is that it does not actually resolve the conflict, and you only grow emotionally at- tached to the situation. Besides, having others agree with you on how bad things are only reinforces your belief that things are bad, because you now get ‘social proof’. The best thing you can do is avoid this type of con- versations, or re-direct the conversation on to a different topic. I thoroughly recommend the handbook 'From Conflict to Calm' and the associated workbook that comes with it. Cristina has written an engaging story alongside a clear identification of what she learned from the experience. Having done so, she has done us all a kindness in sharing her learnings with us. The book is not prescriptive or diagnostic, it simply invites us to explore ourselves and our thoughts and our feelings and trusts that we can all find our own path from conflict to calm. Click here to find out more and to buy this excellent and useful e-book.